A familiar construction in Latin is the ablative absolute, which “define[s] the time or circumstance of an action” (A&G §419). Caesar, whose actions are very often defined by timing and circumstances, makes quite liberal use of this construction, e.g. (The letter having been received, Caesar sends a messenger). (These things having come to light, Caesar makes a speech to the soldiers). For similar such constructions, Anglo-Saxon uses the dative case, and Greek the genitive (both languages lacking the ablative). (but having hope, with your faith increasing, that it be magnified abundantly in you according to our rule). (their conscience bearing witness to them, and their thoughts between themselves accusing, or also defending one another). Plater and White note that such constructions are much more common in the Old Latin Bible than they are in Jerome’s Vulgate (§44). But why is this construction, alien to (Classical) Latin, there in the first place? Why is it non uniformly rendered with the ablative absolute throughout? Further still: does the genitive absolute appear elsewhere (perhaps even as a consequence of Jerome’s use) in Late and Mediaeval Latin? I hope to come up with some instances. Please let me know if you find any. Allen and Greenough’s New Latin Grammar. Plater and White’s A Grammar of the Vulgate. Caesar’s de Bello Civili, De Bello Gallico. Latin translation presents us with tempting cognates, but often enough these have changed so much in their transition into modern English that it would be unreasonable to employ them in a straightforward way. Terribilis is just such a false friend. We now most often use the term Terrible to mean Very bad or repulsive (“What a terrible thing to say!”), or even just Very (“I’m terribly sorry”). This is a far-cry from its meaning in Latin, is clear from a glance at the translation in the image above. We might be tempted to translate this as follows: “Our camps are safe enough when it comes to walls, but they are infested with poverty.” But Infestus here (and very often) means not “Infested” but “Exposed to, at risk of” (or, in some other cases, “Hostile”). The camps are not overwhelmed (‘infested’) with poverty, but merely at exposed to scarcity or want. Let this be a cautionary tale. Very well. But Murray’s translation dates back to 1924; and I would be surprised if Murray didn’t have the Latin in mind when he wrote this. Still, if I tell you my helmet is terrible, will you expect me to get a new one, or will you expect drivers to cower as I merge? This is a minor note about a grammatical anomaly. Reading Leonard Palmer’s classic book The Latin Language (1954, reprinted in 1988), I came across a point about a fossilised form of Early Latin. It turns out that the -as ending of Pater familias (“Father of the family/household”) is actually an archaic genitive (p.97). Probably this explains why Familia either does not decline in this set phrase (for instance, it has an attested genitive form of Patris familias, and of Patrem familias as accusative), or, when it does, it declines as any other first declension feminine noun (i.e. as -ae, etc. ); and why it does not decline the way Latin nouns ending in -as in the nominative singular tend to do (that is, as third declension nouns; in this case, as *Patris familiaris in the genitive). Quibus rebus accidit, ut pauci milites patresque familiae, qui aut gratia aut misericordia valerent aut naves adnare possent, recepti in Siciliam incolumes pervenirent. It would be interesting to see whether this anomalous form results in confusion in later Latin. I wouldn’t be so surprised to find a medieval author declining it as, e.g., *Patris familiaris in the genitive (*Patrem familiarem in the accusative, etc.). I will keep my eye out. Palmer, Leonard. The Latin Language. Oklahoma: University of Oklahoma Press, 1988. AEDEM B[EATAE] MARIAE / ANTIQVITVS CISTERCIENSIVM AEVI / INIVRIA CORRVPTAM PLERIQVE TAM / CIVES QVAM EXTERI CONLATA PECVNIA / OPERE ET CVLTV SPECTABILI / RESTITVERVNT ANNO MDCCCL. A church of the Blessed Mary, which long before belonged to the Cistercians, and had deteriorated with age; and which many people, both citizens and foreigners ―having gathered together money for the task― restored with notable handiwork and adornment, in the year 1850. One of the words here with a long and interesting history is Aedes. The word has a variety of meanings: it can mean House or Dwelling-place, and also (esp. in a pagan context) Temple. Hence Virgil speaks poetically of the “[apes] clausis cunctatur in aedibus” (“[bees] lingering in closed-up dwelling-places [i.e. hives]”); and Varro describes the Aedilis (Aedile) as “qui aedis sacras et privatas procuraret” (“the one who looked after Aedes, both sacred and private”; De Lingua Latina V.81). More specifically, it can refer to the shrine as an inner part of a temple; Pliny the Elder, for instance, makes mention of a much-admired sculpture of Hecate “in templo Dianae post aedem” (“in the temple of Diana, behind the shrine”; Naturalis Historia XXXVI.32). Later on, however, the term came to mean Church, as it does in the inscription above. I am still looking for evidence of its use in this way among early Christian writers. Leonard Palmer (pp.186ff) remarks that early Christians preferred to borrow Greek terms such as Ecclesia (Eκκλησία) to describe churches, rather than to use terms like Templum and Fanum, which were laden with pagan connotations. Perhaps later on, when paganism was not such a going concern, use of Aedes was revived. I tentatively submit that this might have been due, as often seems to be the case, to the poets: even Avitus of Vienne (ca. A.D. 470-519) uses Vates (Seer, Soothsayer) to mean Prophet, where earlier Christian writers (especially prose writers) would have opted for Propheta. But I should emphasise that this is merely a guess. Avitus’ The Fall of Man (De Spiritalis historiae gestis; note that this work had a significant influence on John Milton). Palmer, Leonard. The Latin Language. London: Faber & Faber, 1954. Pope Pius XI, since the middle portion was also in need of building up, took pains to do so, and restored its memory in the year 1852, the seventh year of his pontificate. The mythic history of the Colosseum is replete with accounts of martyrdoms of Christians within its walls, and for this reason has been a site of pilgrimage for centuries. Pope St. Pius V (whose pontificate lasted from 1566-72) is reported to have encouraged pilgrims to gather sand from the arena which contained the blood of martyrs. Yet this interest in the Colosseum seems to have been a phenomenon originating in the Renaissance: there is virtually no evidence of a medieval tradition associating the martyrs with the Colosseum. And, even in the Renaissance, this pious association was apparently sometimes met with scepticism or even disinterest. Sixtus V (1585-90), for example, proposed that the Colosseum be converted into a wool factory, but died before this plan could be put in motion. And in 1671, the Colosseum was even designated as a space for bullfights. However this attitude changed gradually, helped by a popular guide for pilgrims to Rome by a writer called Martinelli. In 1675, Pope Clement X ordered that the exterior arcades of the Colosseum be closed, and that the interior space be converted into a sanctuary. The Latin here apparently contains a reference to an interesting practice of ancient Rome: the Triumphus, a celebratory procession made by victorious generals from the Campus Martius to the Temple of Jupiter Optimus Maximus. In imperial times, this procession was altered, so that it was made from the Campus Martius to the Temple of Mars Ultor. The purpose of the triumphalis was, bluntly put, to show off things and people captured in military campaigns. Hence Cicero asks “Quid tandem iste currus? quid vincti ante currem duces? quid simulacra oppidorum? quid aurum?…” (“What, finally, is this chariot? what captured things do you lead in front of it? what images of towns? what gold?…”; Oratio in Pisonem 25.60); and Suetonius reports that “Gallos Caesar in triumphum ducit” (“Caesar led captive Gauls in the triumphal procession; Caes. 80). […] Si tantummodo cultus ipse dicatur, non soli Deo deberi uidetur. Dicimur enim colere etiam homines, quos honorifica uel recordatione uel praesentia frequentamus […]Nam ex hoc uerbo et agricolae et coloni et incolae uocantur, et ipsos deos non ob aliud appellant caelicolas, nisi quod caelum colant, non utique uenerando, sed inhabitando, tamquam caeli quosdam colonos. …if Cultus alone is what is said, it does not seem to be owed to God alone. For we are said also to honour (colere) other people, that is, those whose honour, either by memory or by presence we celebrate […] for, from this word, we derive the words Farmer (agricola), Husbandman (colonus), and Inhabitant (incola), and the gods themselves are called Heaven dwellers (caelicolas) for no other reason than that they live in the heavens — at any rate, they are so called not because they worship the heavens, but because they live in them as, so to speak, inhabitants of heaven. The Catholic Encyclopedia entry on the Colosseum. Augustine’s City of God on New Advent, translated by Marcus Dods. Augustine’s works (Latin), including De Civitate Dei, via The Latin Library. Decius Marius Venantius Basilius, a famous and high-born man, Prefect of the City [i.e. Rome], a Patrician and Consul Ordinary, has restored at his own expense (sumptu proprio) the arena and podium [of the Colosseum] which the disaster of a deplorable earthquake had laid low. 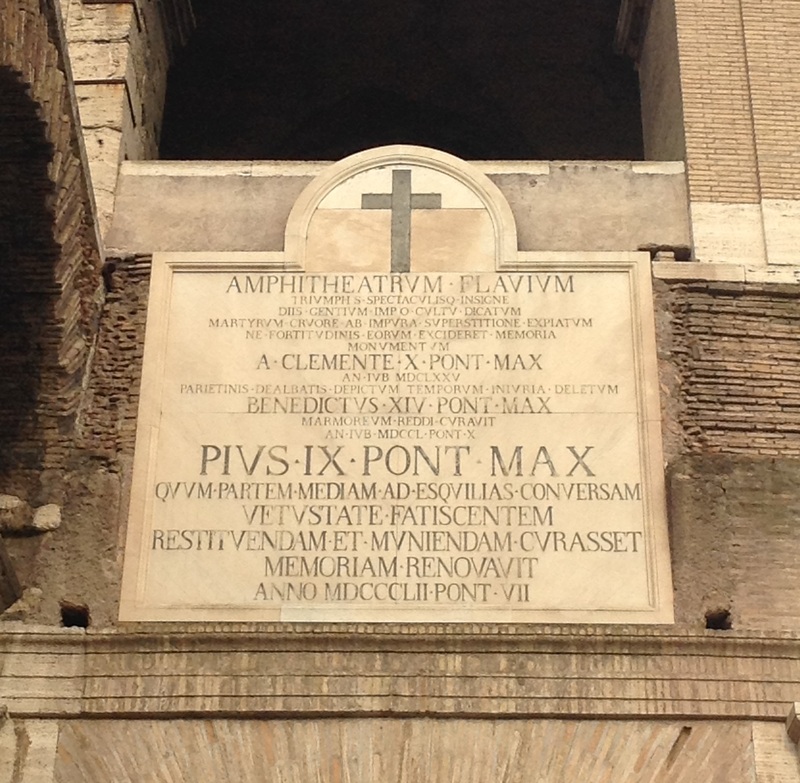 This inscription (CIL VI.1716 b) is one of a few I photographed while I was at the Colosseum (also sometimes called the Flavian Amphitheatre), and which I will be translating and posting on the Medieval Latin blog. 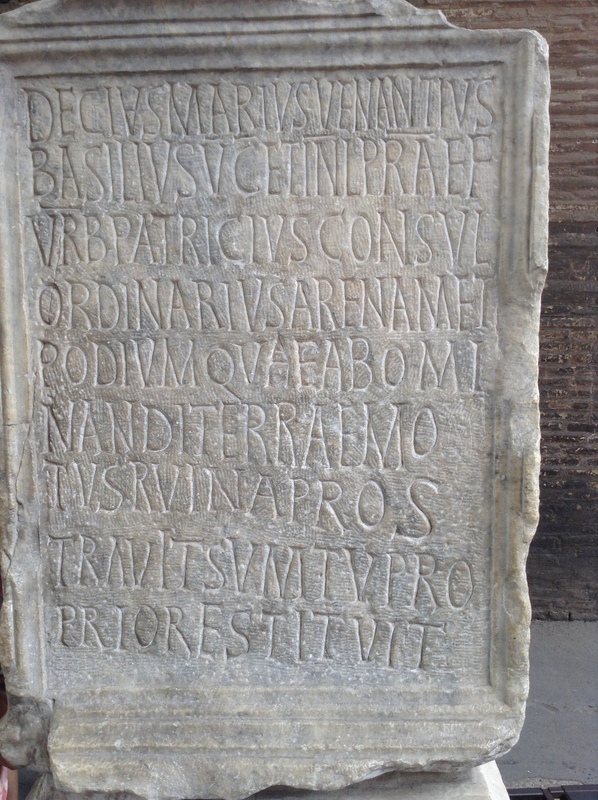 The inscription itself commemorates the reconstruction of key parts of the Colosseum, destroyed in an earthquake ca. A.D. 443: namely, the Podium, which comprised the front-row seats reserved for distinguished guests; and the Arena, a word we still use in English with much the same sense, but which also denotes in Latin the sand on which the spectacles would be performed (itself called Arena or Harena). The Latin also contains a few examples of official Roman titles, which merit explanation: as a Vir Clarissimus, Venantius is of senatorial rank (or in the family of someone of such rank); he has been made Prefect of Rome (Praefectus Urbi), an appointment akin to mayor of the city, which would have been granted to him by the Roman emperor; the status of Patrician (Patricius) originally identified a descendant of the early Senators of Rome (see Livy, ab Vrbe Condita 1.8), but had waned in importance in the imperial period; finally, as a Consul Ordinarius, Venantius was one of the two highest magistrates in Rome (Ordinarius designates the position as it is normally held, as opposed to a Consul Suffectus, i.e. one appointed in place of another who has died, fallen ill, etc.—or, from the time of Julius Caesar, one appointed to replace a living Consul Ordinarius, with the aim of increasing the number of consulars). An overview of the Roman Cursus honorum, the ranks of the Roman Empire, via VROMA. A brief history of the Colosseum, in The Catholic Encyclopedia. Welcome to the first post on the Mediaeval Latin Blog! Most of the posts on this page will feature editions and translations of Latin texts from the Middle Ages. 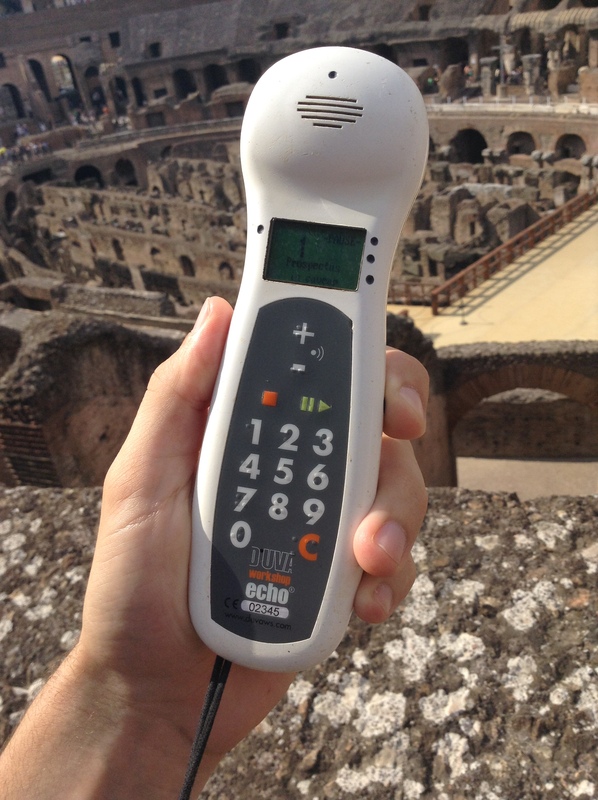 This modest inaugural post is to alert readers to the Colosseum’s audio tour guides, which are available (linguas inter alias) in Latin! There are a few details about the audio guide worth reporting. First, the Latin is very good, and relatively well-adapted to the demands of an audio tour: it tells you where to look, and familiarizes you with the Latin names for the parts of the Colosseum. Second, it features some inventive neo-Latin. For example, at the end, the voice instructs you to return your vocis machina, “voice machine” (apparently a genetive of characteristic; cf. e.g. Horace’s magni formica laboris; Sat. 1.1.33), to the kiosk. And finally, the accent is a clear and beautiful ecclesiastical one, not the reconstructed classical accent found in most primers of the language. 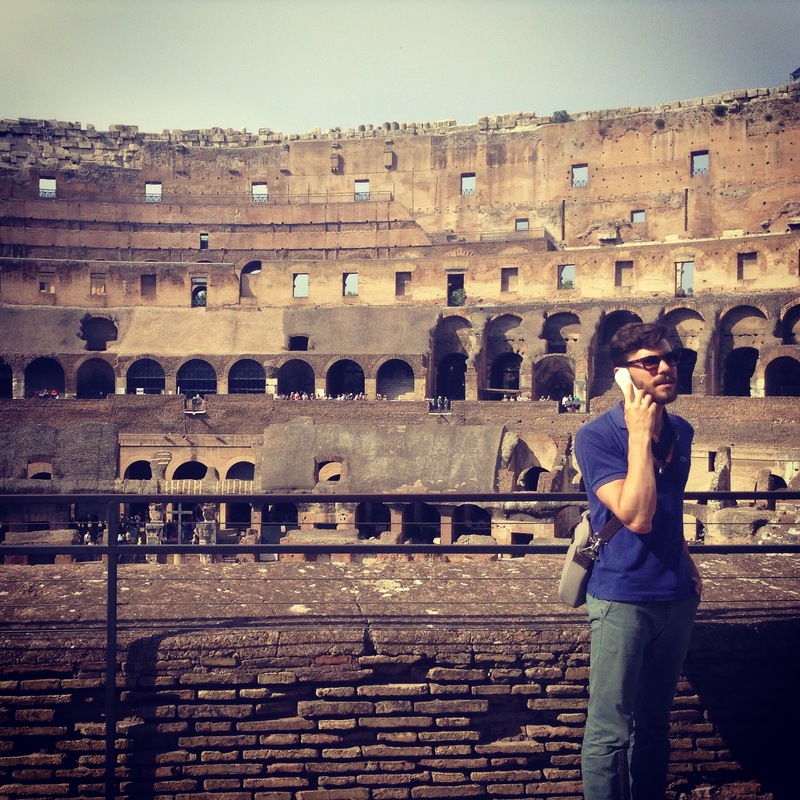 If you will be visiting the Colosseum any time soon, why not give the Latin tour a try?